1. Make the pico de gallo. Peel the plantains with a potato peeler, then halve them lengthways and chop them into 1cm chunks. In a large frying pan, heat half the oil on a high heat, then add your plantains and toss well. They will become nicely caramelised. Stir them regularly to prevent them sticking and remove when they have some nice crisp brown bits – roughly 5-7 minutes. Set aside, uncovered. 2. Add the rest of the oil to the pan. On a high heat, saute your onions and peppers) and stir well. After 5 minutes, when they are beginning to caramelise, add the tofu, garlic, cumin, coriander, turmeric, paprika, oregano, chillies and salt. Cook and stir for a further 5-7 minutes, adding 1 tablespoon of water to ensure the spices are not sticking to the base. Now stir in the cooked plantains and check the seasoning. Cover and set aside. 3. Wipe out the frying pan with kitchen roll and warm your tortillas for a minute on each side (or you can warm them beforehand on a medium grill). They should be just warmed through, fragrant and still soft and pliable. If they are too toasted, they break when wrapping. 4. Spoon 3 tablespoons of plantain filling into the centre of each tortilla and top with 2 tablespoons of pico de gallo. Fold in the two opposing edges, pressing gently down, then roll the whole thing over. 5. 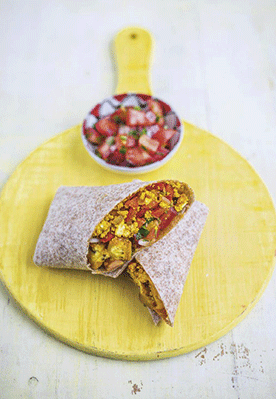 Serve these burritos warm with more fresh chillies or chilli sauce. Pow!